For a while now I’ve been sort of fascinated by the culture, style, and architecture of New Mexico, a state that I’d only been through on a train. I finally had an opportunity to visit, and it didn’t disappoint. I actually stayed between the two cities in Bernalillo and spent a day in each place. 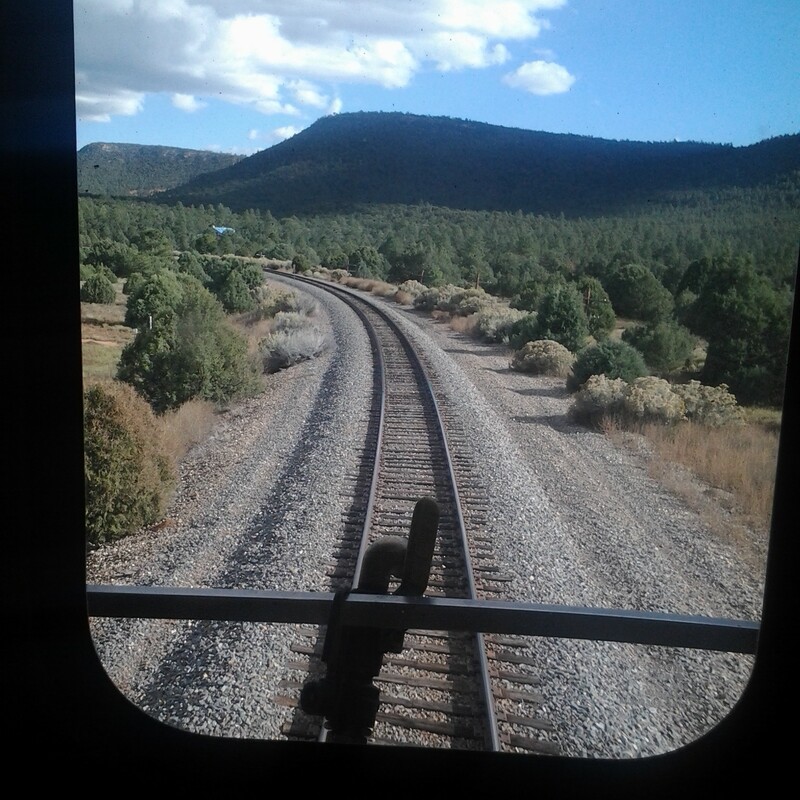 Rather than driving, paying for gas, dealing with traffic, and figuring out where to park, and paying for that too, I took the New Mexico Rail Runner commuter train. It’s really cheap (the hour-long trip to Santa Fe was $9, downtown Albuquerque only cost $4), convenient, and the scenery can’t be beat. Train tickets also get you onto the city buses at no extra cost, just show it to the driver. The station in Albuquerque is right downtown, but a couple of miles from the Old Town section that I wanted to visit, so I hopped a bus and rode through the city. Old Town is arranged around a central plaza with a large church on one side and surrounded by many shops and tour options. I never got into Breaking Bad but apparently it takes place and/or was filmed in Albuquerque and they do everything they can to capitalize on that fact. I found a sign advertising a funeral procession for Walter White and I one point I saw a tour bus with what appeared to be a meth lab in it. Leaving Old Town, I got back on the bus and headed over to the Albuquerque Botanical Garden. The garden is half of the ABQ BioPark, the other half being a zoo. $12.50 for one or the other, $20 for both, and a small train runs between them. The garden also contains an aquarium, so the one ticket includes plenty of animals along with the plants. The gardens are beautiful of course, with a farm section, a Japanese garden (my favorite), a lake, two greenhouses, a butterfly house (summer only) and model trains. I didn’t even know garden trains were a thing, but I guess it’s a pretty serious hobby. There’s also a playground shaped like a castle, complete with tunnels, giant flowers, and an ivy-covered dragon. I find jellyfish weirdly beautiful. I really liked Santa Fe. It was a little more desertish than my ideal but there were grassy parks about every ten feet to make up for it, and it’s at a high enough elevation (7,200 feet) to have plenty of big trees. Some of the oldest buildings in the country are here, so I was surprised by how many high end shops there were and how artsy the town was in general. I guess I figured it would be a little more traditional or something. The Santa Fe River runs right through town. The Palace of the Governors, the oldest public building in the United States. The beautiful Cathedral Basilica of Francis of Assisi dominates a whole city block and can be seen all over town. I happened to be there on Good Friday so things were closing up all over the place for people to attend the 1:30 service. The proximity of the Los Alamos labs to Santa Fe also piqued my interest, but I didn’t have time to visit the museums dedicated to that particular aspect of this region. Central New Mexico is definitely interesting, and a place I’d like to explore the history of further on another trip. I left Arizona and have now made it across New Mexico and half of the Texas panhandle. I-40 parallels Route 66 through this area so even though I’m not on that road I’m passing through the same towns, most of which still embrace their Mother Road history with many hotels and quirky tourist traps from that era, and of course plenty of memorabilia. I feel like the land is getting progressively flatter and emptier as I go. Still looking forward to trees. I woke up at 5:30 one morning to a nearly complete lunar eclipse that I had totally forgotten about. I’m always surprised by how many abandoned buildings there are on the plains. Maybe it’s just because they’re out there in the open, not hidden by plant growth, but they seem to be everywhere. Trespassing has never been something that bothered me much, but these places always feel so exposed I can never bring myself to explore them. I get questioned by the police often enough as it is. This was a fascinating look into the sudden rise of Oak Ridge, Tennessee, and the everyday lives of its residents. The town grew up around the nuclear enrichment factories that were part of the Manhattan Project, an organization so secretive that most of the workers had no idea what they were actually working on. Many of them were women out on their own for the very first time. The stories were a little heavy on the women noticing how many single men there were around them, but I guess if that was what was going on, that was what was going on. Amongst the experiences of the female employees and their feelings about the work they were doing, Kiernan does a good job of explaining the history and science behind the rise of the Manhattan Project and its role in World War II. “And if you got your M voltage up and your G voltage up, then Product would hit the birdcage in the E box at the top of the unit and if that happened, you’d get the Q and R you wanted. It was that simple.” – they seriously had NO IDEA what they were working on. So I’m in Arizona for the winter, and instead of spending 3 super crappy days or 5-6 somewhat less crappy days in a car, spending hundreds of dollars on gas, lodging, and food, I decided to let Amtrak do the heavy lifting. For $154 I got to spend two days lounging around reading & watching the world go by while still managing to end up on the other side of the country. Flying would have been shorter, but almost certainly more expensive (I have better things to do than check prices on 47 different airlines) and a bigger pain in the neck. I boarded the train with absolutely no hassle. I didn’t have to show up two hours early, or spend any time at all standing in line to have a stranger pat me down & look at my skivvies through some weird Star Trek machine. I brought a large backpack, 44-pound duffel bag, purse, blanket, pillow, snacks, outside water, AND nail clippers on board, nobody batted an eye. Try getting all that on a plane. A pigeon in the waiting area of Union Station. Along the way I got to see not only my origin & destination, but everything in between. I wasn’t hurtling along 30,000 feet above it, I got to be a part of it, all the wild animals, little towns, big cities, and beautiful landscapes across nearly 1,800 miles, with no effort involved. And seriously low-stress travel: wide comfy seats, footrests, legroom, no screeching babies, and there was a whole lounge car to go hang out in if I got tired of my little nest. My fellow travelers were pretty mellow too, the only time I heard anyone get even a little upset was some guy who didn’t like his upper level seat because he struggled with stairs; the conductor put the smack down on him pretty fast, he’d bought the wrong kind of ticket, and there was no fixing it now. I never saw anyone being rude to other passengers or staff. Even the cell-phone chatters were quiet and respectful of the people around them. Upper floor of the lounge car with its huge windows. Lounge car lunch. Personal pizza & can of Mountain Dew, $8.25. A bit steep, but it was nice to have one meal that wasn’t peanut butter based. Crossing the Raton Pass into New Mexico. The only problem I had was with my second seatmate. The first one was pretty close to perfect, he sat quietly and we ignored each other for five hours until he got off in Missouri. The second lady, she wanted to talk. She gave up on me pretty fast, because I went mm-hm and stuck my earbuds in, but I saw her chatting up other people through the whole trip. Not one time did I see her sitting alone reading or whatever. I don’t think she even slept, she was like some kind of chatty vampire, feeding on other people’s exhaustion. Speaking of sleep, it was surprisingly easy to come by. We spent the night crossing the plains so there was nothing to look at anyway, the seat leaned back pretty well, with enough space that I wasn’t in the lap of the person behind me, I had my blanket, pillow, and eye mask. I took a drowsy motion sickness pill to help a bit (I didn’t need them for nausea and I need those for small roller coasters) and just passed right out. Mississippi River, having just crossed into Iowa. Dawn, Day 2, somewhere in western Kansas. Yeah it took forever, but this was a great trip. I re-read one of my favorite books (Tricky Business, by Dave Barry), saw lots of interesting, beautiful things, and finally got to cross the Southwest Chief off my bucket list. So many people just want to get where they’re going, they miss a lot. The difference between planes & trains is the difference between tourists & travelers. Do you want a journey – an experience? Or merely a destination?